For anyone who’d rather be reading than doing just about anything else, this book is the ultimate must-have. In this visual ode to all things bookish, readers will get lost in page after page of beautiful contemporary art, photography, and illustrations depicting the pleasures of books. Artwork from the likes of Jane Mount, Lisa Congdon, Julia Rothman, and Sophie Blackall is interwoven with text from essayist Maura Kelly, bestselling author Gretchen Rubin, and award-winning author and independent bookstore owner Ann Patchett. Rounded out with poems, quotations, and aphorisms celebrating the joys of reading, this lovingly curated compendium is a love letter to all things literary, and the perfect gift for bookworms everywhere. 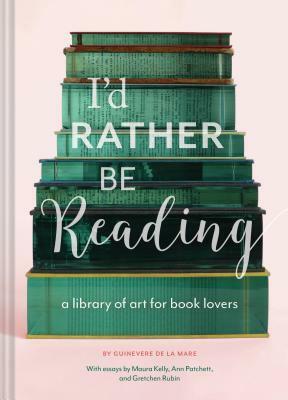 I’d Rather Be Reading: A Library of Art for Book Lovers by Guinevere de la Mare is a charming and insightful nonfiction piece on the love of reading and bookish artwork. Filled with inspirational messages on the importance of reading and unique images demonstration the essence of reading, Mare’s novel touches the hearts of both readers and non-readers. This dainty and elegant novella is roughly half images and half words. The layout and pattern throughout the book is an essay, followed by a variety of book images, to another essay, and so on. Mare begins by describing her own experiences with reading and literature, providing a more intimate relationship with the author. The remaining essays follow a similar suit, giving this aura of personal connection simply through the words written on the pages, though each author provides a different insight into the realm of literature. From preventing reading slums to highlighting the importance of reading, each contributor to the novel brings a new element and lesson for readers to examine and decide what they wish to do with this new profound knowledge. For those of you who are feeling discouraged and disheartened with book reading, you MUST give this book a chance. This year has been utterly awful with my own reading goals…it’s rather bothersome. However, I found almost all the essays provided some wonderful words of wisdom and comfort to those who are feeling neglectful towards their books. One thing I didn’t appreciate, however, was the thoughts of one contributor. I found the thoughts rather pushy and intrusive, as though those who don’t read are on this lower pedestal in life…which is ridiculous. I feel sorry that those individuals are missing out, but there’s no need to become condescending. Though I may have read to into this, that’s how I felt. The illustrations are an obvious focal point of this novella — the subtitle is a library of art for book lovers after all. Mare did a wonderful job displaying a variety of book photos, allowing for all readers to feel a connection to at least one photo, if not more. From quotes on book to pictures of bookshops, the variations are endless. The illustrations were by far my favourite element of this novella; not only did the images give me this feeling of nostalgia and happiness, but I found to feel intimately connected with my recent desires to focus more on my bookstagram. If you simply want some book imagery in your library collection or need some ideas for your own photos, this might be for you. Mare and the three other contributors write simple yet educated, focusing largely on the emotion behind the words rather than providing essays in a more academic manner. Clean and concise, the fluidity of the language makes it easy to finish without realizing it. For this type of nonfiction novella, the personal connection works wondrously; the more academic approach would feel distant and create this disconnect with the readers. Mare’s I’d Rather Be Reading: A Library of Art for Book Lovers is a lovely and lighthearted read, providing readers comfort through the simplicity of words and images. Less than one hundred pages long, this quaint little novella bestows a grandiose amount of entertainment and is easily finished in one sitting. Though Are you in a need for a book loving “pick-me-up”?